Messages for the development language can be read, from the database, one message file at a time. This message file can be used by both the development environment and your LANSA created applications. Only the Message identifier and a portion of the First Level Text is displayed. If you can only initially see the Utilities icon, widen your window. You need to have proper authority to be able to amend the LANSA internal messages. Refer to 8.7.5 Add/Change Message Text to add a message or to change an existing message. An existing message can be deleted by first selecting the message in the list and then selecting the Delete button. 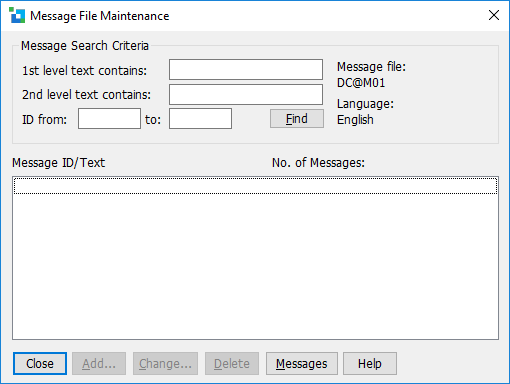 Note: The changes made in the Message File Maintenance dialog are committed to the database and the host as a result of the Change, Add and Delete buttons. See also User Defined Messages in the Application Design Guide before editing the message file.